The humble Ouija Board, a beloved part of childhood slumber parties, cheesy sitcom plots, and top-10 games lists. Even though it’s just a board and disc, it can produce captivating evenings where people explore a mystical world. The idea that it is possible to communicate with the dearly departed is intriguing and something that, for a lot of folks, appealing. Human beings have always been fascinated by death and the thought that we can maintain our communication with the living from beyond the grave can, frankly, be comforting. Where most people’s experience with a seance begins and ends with the Ouija Board, there are those who have dedicated their lives to the idea of communicating with the dead. 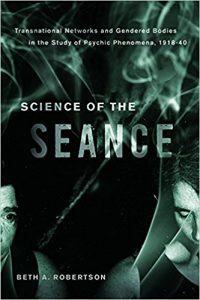 In her new book Science of the Seance: Transnational Networks and Gendered Bodies in the Study of Psychic Phenomena, 1918-40, Beth A. Robertson introduces readers to some of the professionals who dedicated their careers to examining the science behind these mystical meetings where people tried to talk with those who were no longer in the realm of the living. Moving beyond the question of ‘is this real,’ Robertson explores the networks these scientists built, their strategies for investigation, and the gendered spaces in which they worked. In this episode of the History Slam, our first ever episode with a live audience, I talk with Beth about the book. We talk about the scientists who conducted the research, how they connected with each other, and the ways in which the space became gendered. We also open the floor to questions from the audience and discuss the challenges of researching such a unique topic.